In 1933 Hitler came into power. In 1936, G. K. Chesterton died. In between, Chesterton kept his eyes steadily on the Nazi movement, seeing and foreseeing everything—even to the agreement of Germany and Russia to divide Poland. Week after week he came back to one aspect or another of the danger: Prussianism as a spirit poisoning Germany, Hitlerism as Prussianism, the special peril (unique in human history) that lies in racism, the Jewish roots of Hitlerism, the vital function of Poland, and the elements among ourselves that made for the increase of Hitler’s power—especially the pacifism that made war inevitable. It is not too much to say that this inevitablility of war was the dominating theme of the last years of Chesterton’s life. Certainly it was never far from his pen. 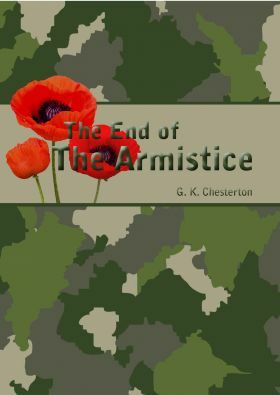 A great mass of his writing on the subject has here been sifted and arranged; and though the author had been dead for four years (now seventy-eight years) when this work was published, the book constitutes a most moving statement of what the war (WWII) is (and was) about. It is scarcely too much to say that he took it for granted as a simple fact of future history. That is to say he saw it not as possible, nor as probable, but as a thing already on the way and humanly speaking certain to arrive. He saw how it would arrive—Germany would attack Poland; he saw closer still, that Germany would do so in agreement with Russia. Now when a man is as right as that in his forecasts, there is some reason to think he may be right in his premises. The importance of the premises and conclusions presented in this compilation of Chesterton’s thought has not diminished in the seventy years since the war he foresaw. History teaches us many lessons. Let those who are able to read this book, do so, and thereby gather some wisdom against the coming storms of the 21st century.